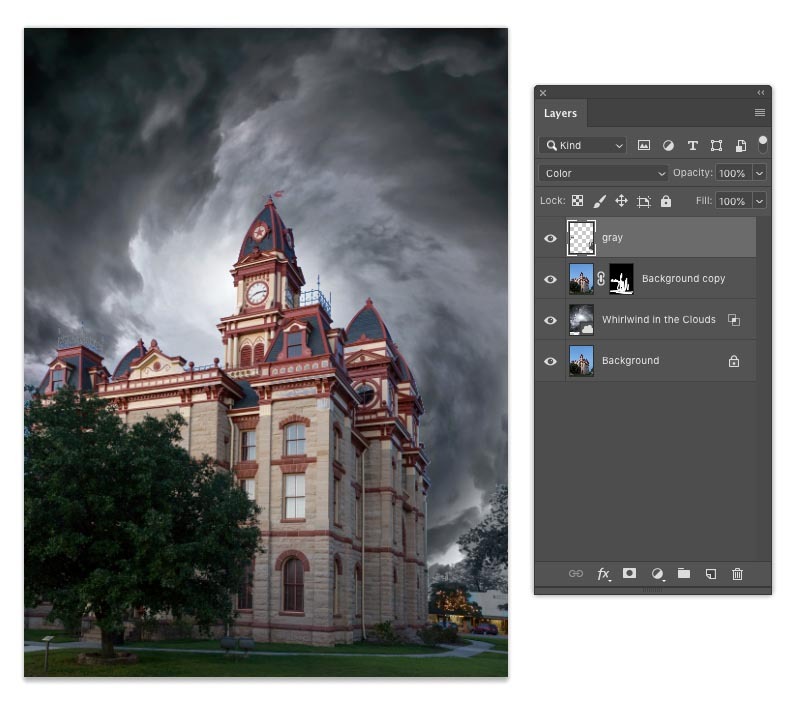 This Photoshop tutorial shows you how to replace a boring blue sky with a dramatic cloudy sky. 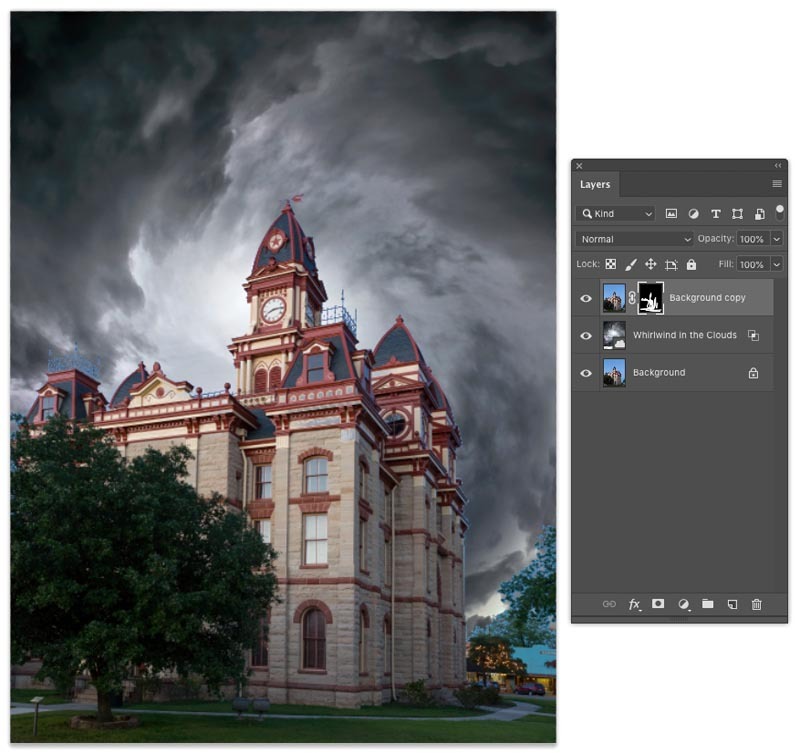 In this Photoshop Tutorial, I’ll quickly show you how to replace this sky without making any selections. We will begin with a photograph that I captured just outside of Austin Texas. 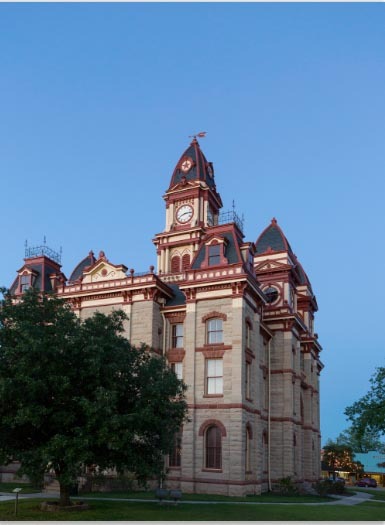 It’s a really interesting building (Fun fact: it was featured on the TV show, The Leftovers). The problem is that the sky was plain blue, which isn’t so bad if you use a polarizing filter to make it more blue, which I did. However, because I don’t live in Texas (I’m in California), I’m unable to go back when the sky is different to get a more moody photo. 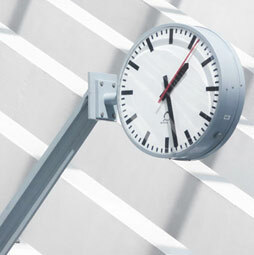 This is a common issue for people who travel and have limited time to capture photographs and have to take the best they can get, given the opportunity. If you don’t have the right sky, you can always grab one from stock. 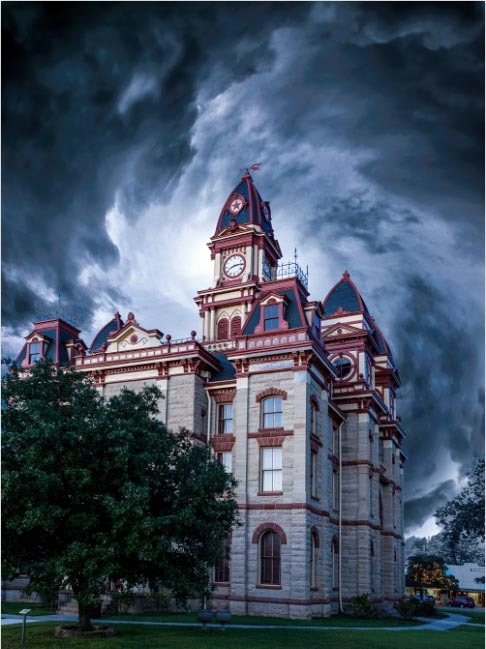 Here is one that I got from Adobe Stock, that looks really nice and eerie, maybe make a good haunted house out of it. Ok, on with the tutorial.. 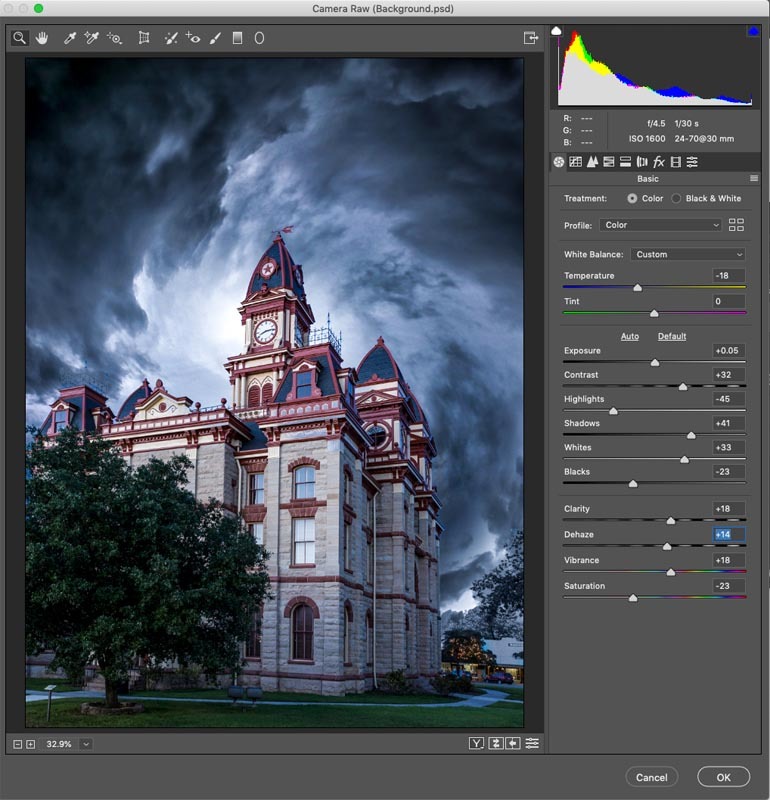 Drag the sky into the house photo, it will become a new layer. Choose Cmd/Ctrl+T for free transform. 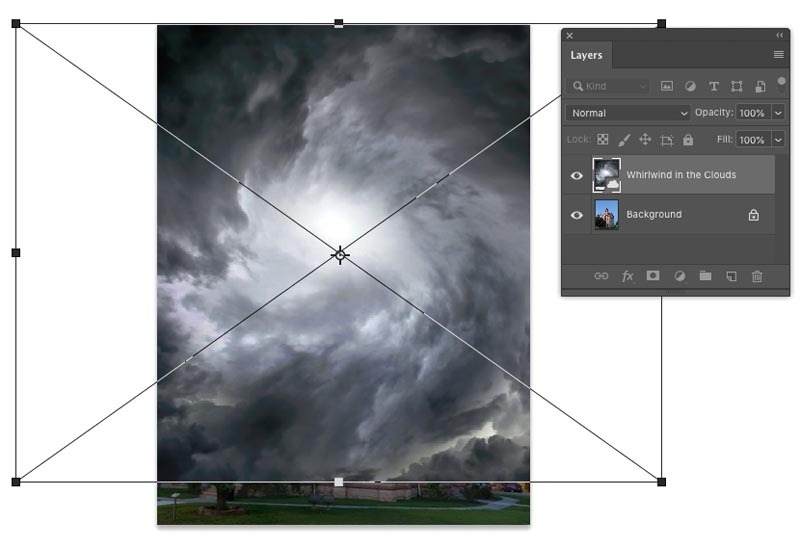 Drag the corner handle to resize and reposition the sky. 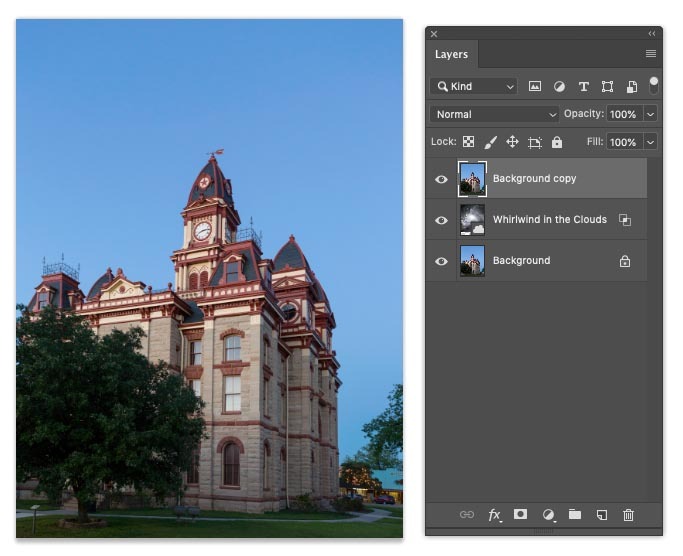 (Pre Photoshop CC 2019 – Hold down the Shift Key to constrain proportions). This is usually where you grab the masking tool. We won’t need to do that in this tutorial because we have a blue sky. As you slide the slider, you will see that the blue sky will be replaced by our clouds, move it as far as you can before the clouds start to disappear. 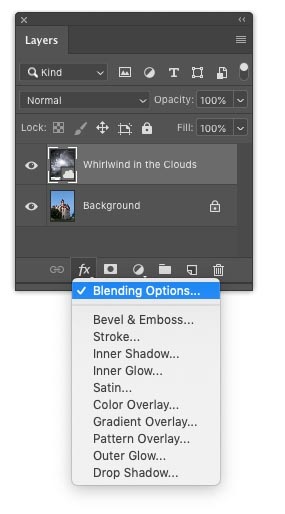 Now we need to finesse the selection, hold down Alt/Option and drag on the left of the triangle, you will see that it now splits and enables use to refine our blending. You might have noticed the selection isn’t quite perfect, we may have lost a little of the house, let’s fix that. If we paint with white, we can bring back parts of the layer. Paint on the house where it was blending out, so that all the house is showing again. I mainly found it fading out on the windows. Notice that there are some areas of blue around the tree to the right and a couple of other spots, let’s fix it. 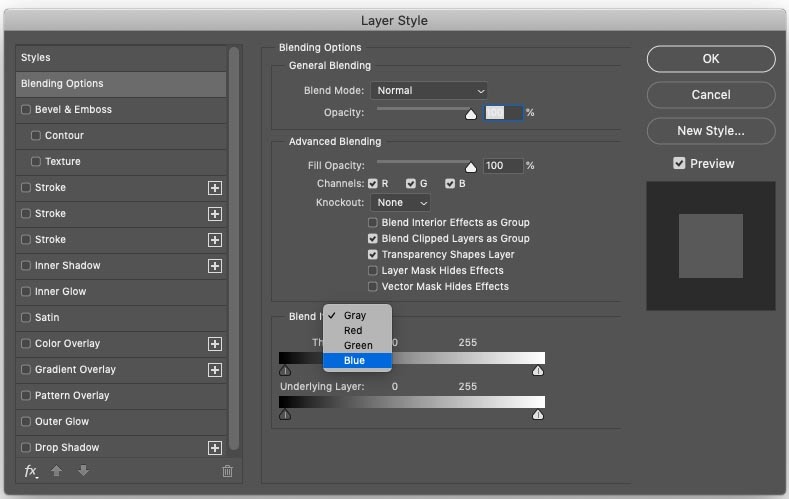 Create a new layer on top and change the blending mode to color. 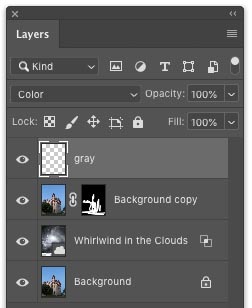 The first thing you need to do is get everything on a single layer, we don’t like to flatten, because that limits options later. Select all the layers (Click and Cmd/Ctrl click on the layers) and Press Cmd+Option+Shift+E (Ctrl+Alt+Shift+E) This creates a Stamp Visible layer, or composite layer. You can see the adjustments I make here in the screen shot. And now we have something that looks a bit more like something out of the Adam’s Family. PS, drop a comment and say hi! After you are finished, do you leave the Stamp layer? 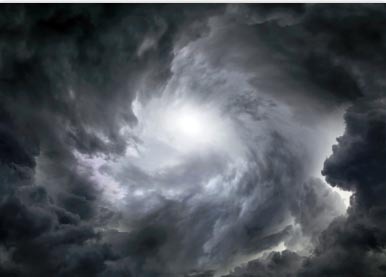 In the beginning of the video, you pasted the swirling cloud background in and enlarged it to cover the whole sky. You didn’t cover the whole sky and told us not to worry, that we would get to that later. 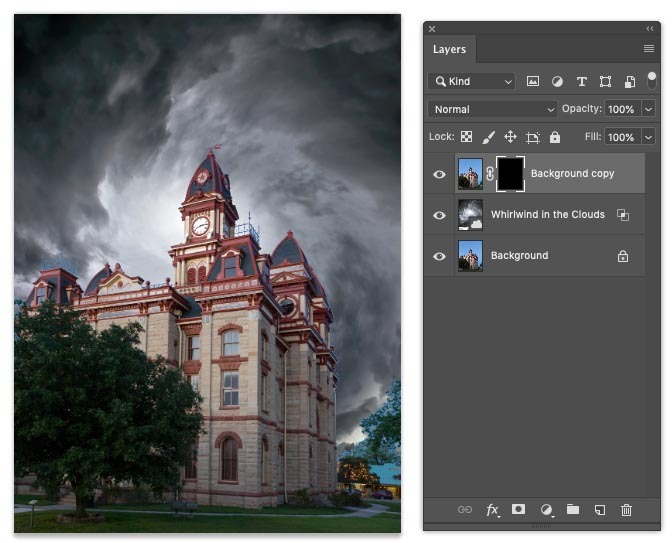 If you did cover the bottom of the image with the clouds, it would take care of all the extra blending and color adjustments for that tiny corner area. I do learn things from you, Colin, but sometimes you make me wonder as well. I’m human and make mistakes, but it didn’t stop people learning from the tutorial. My goal was to teach, not create a portfolio piece.